Don't miss the extraordinary experience of Shakespeare performed in the space for which it was written. This isn't dusty Shakespeare. This is Alive. Like a party. Pop-up Globe is an ideal experience for social and corporate groups. A haunting and timeless tragedy that explores the darkest corners of the human mindset in a world where the supernatural is real and the quickest way to the top is by murder. 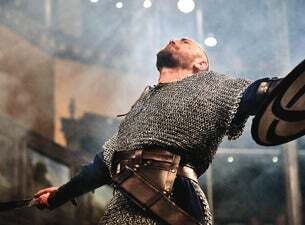 Macbeth, presented by Pop-up Globe’s mixed Southampton’s Company sees darkness, chaos and conflict unfold. If you purchase a Groundlings Ticket you will be required to stand for the performance. All other prices are Reserved Seating. Please note that blood and other fluids may spatter from the stage. If you are located in the Groundlings or front of the Lower Gallery and this is a concern, please request a poncho from our ushers to protect your clothes. All blood is non-toxic and machine-washable.